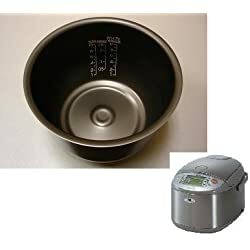 This page provides brief reviews of Zojirushi induction rice cooker units (also known as induction heating) along with descriptions and information about this superior evenly-cooking rice cooker technology. What is Induction Heating and How Does it Benefit? 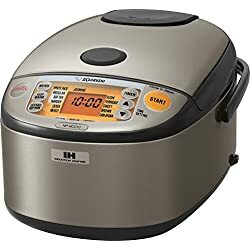 An induction heating rice cooker (or IH cooker) takes the fuzzy logic micom process to the next level as the machine heats the rice in a totally different way. Non-IH Rice cookers, whether they use monitoring technology or not still rely on a heating element that heats from the bottom of the cooking pan. 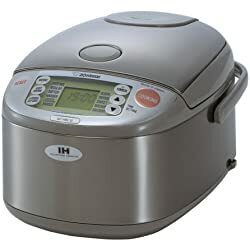 Such a method still produces very high quality rice due to the programmed fuzzy logic rice cooking technology, but a Zojirushi induction rice cooker produces rice that is slightly higher. Induction heating cookers have coils that surround the bottom of the cooking pan and use an electro-magnetic field which heats the bowl more evenly and thus cooks the rice more evenly resulting in a higher quality texture. These Zojirushi induction rice cooker units are the top of the line and use several other methods in combination with induction heating coils. For cooking brown rice, users can select what Zojirushi calls “GABA” which will soak the grains for an additional 2 hours before the cooking process begins. When cooking, the Zojirushi NP-HTC10 & 18 models will also utilize a high temperature pressure cooking system along with fuzzy logic technology that will “pay attention” on how the rice is cooking and make subtle changes along the way. From what many reviewers/owners state, the quality of the brown rice is excellent with a well-developed texture that is fluffier and easier to digest. They are expensive units but are worth it for daily consumers of brown rice who prefer the highest cooking standard. There are also settings for white rice, and sushi rice as well. These cookers offer pretty much the same style of cooking minus the pressure cooking feature which results in just a slightly lower quality when compared…but still way above average results. Like the above Zojirushi induction rice cookers, the NP-HBC10 uses the same surround heating coils to ensure every grain is cooked to perfection whether folks select white rice, or brown rice. There is also fuzzy logic monitoring on board that we mentioned will pay attention to cooking time and internal temperature making slight adjustments as needed during the cooking process. Both units have a modern design with an attractive stainless steel outer shell, are easy to use, and come with non-stick bowls that make serving and cleaning hassle free. The NP-HBC10 is the 5.5 cup cooker, the NP-HBC18 the larger 10 cup cooker. For live-alone chefs or couples who are shopping for a smaller more compact Zojirushi IH rice cooker, please check out the Zojrushi NP-GBC05 unit. Does not offer pressure cooking…but does come equipped with GABA. This concludes our Zojirushi induction rice cooker page. We hoped it provided helpful information for folks looking for a high end rice cooker that is both reliable and makes the best quality rice possible.